EDITOR’S NOTE: Read Part 1 of the series at The Walkout — How a Student Movement in 1968 Changed Schools Forever and Part 2 at 40 Years After “The Walkout” — A Turning Point in LAUSD Education Reform. There was great excitement when the A–G resolution passed on June 14, 2005 (as covered in Part 2 of The Walkout series). 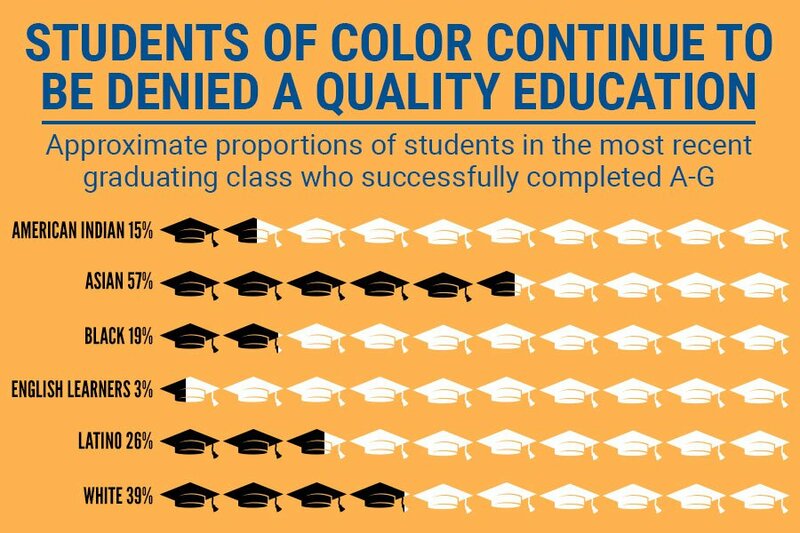 After years of struggling in a system weighted heavily against them, students of color had secured a major victory in the fight for equal educational opportunities. A fight that had begun with the Walkouts of 1968. Since that landmark 6-1 vote in 2005, the number of students completing a college prep curriculum that allows them access to a California State University (CSU) or University of California (UC) campus has grown dramatically. But even now, nearly 13 years later, there’s still a long way to go. As the original resolution was worded, as of 2008, every student entering the ninth grade was required to enroll in the A–G curriculum. Although a student and/or their parents could request a waiver by the second semester of their Sophomore year. Schools were tasked with informing the students and their guardians about all aspects of admission — to not only the UC and CSU campuses, but also community colleges, trade schools, and other post secondary opportunities – all with the goal of empowering them to make their own educational decisions. What’s more, each student needed to establish a high school work plan, with the assistance of a school counselor, that would help them work toward their chosen path. Full implementation was mandated for 2012, at which point every student entering the 9th grade must fully complete the A–G course sequence in order to graduate from LAUSD. It specified that the implementation of the A–G curriculum would include a litany of learning supports and other resources that would begin early in a student’s education to prepare them for the program. It also directed the Superintendent to align and dedicate those resources to ensure that teachers were properly supported in researching, developing, and sharing the curriculum. Given the sheer scale of the Los Angeles Unified School District, and the vast numbers of students and parents to whom this type of college prep curriculum would be entirely new, the resolution was ambitious, to be sure. Which provides one of the first clues as to its slow adoption. For a host of reasons, including concerns that the proper groundwork had not been laid in the intervening seven years to properly prepare incoming students, several board members sought to delay the full implementation in 2012. But on May 22 of that year, the board voted four to three in favor of the implementation plan. But mandating action is not the same as taking action. And concern has grown that a high number of students have not been adequately prepared to meet this new graduation requirement. 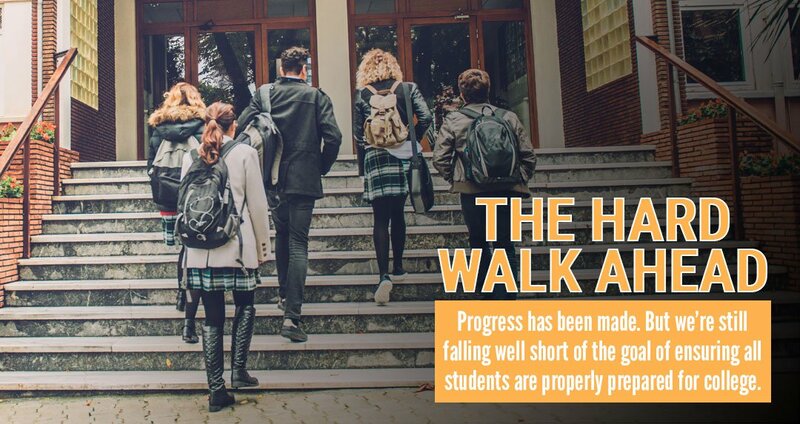 While the original resolution has resulted in more college prep courses across all LAUSD high schools, higher graduation rates, and more students completing A–G than in 2005, progress has stalled. 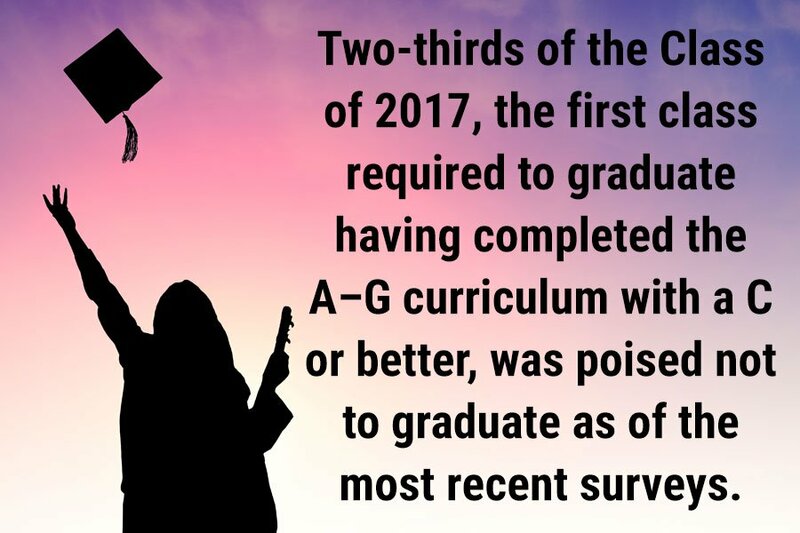 In fact, fully two-thirds of the Class of 2017, the first class required to graduate having completed the A–G curriculum with a C or better, was poised not to graduate as of the most recent surveys. The reasons are many, and it’s possible to point a finger in several different directions. Human nature, lack of interest, and several years of budget restructuring during the recession all played a role. 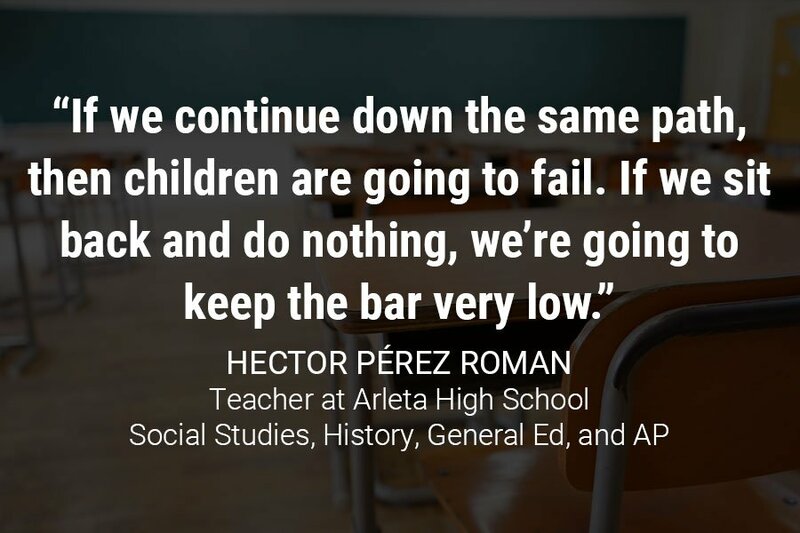 So have competing educational agendas – as explained by Hector Pérez Roman, a teacher of Social Studies, History, General Ed, and AP at Arleta High School. Roman further explained the benefit of preparing for college, no matter what the post-high school plans of a student. “As a professional in the education field, I advocate for a college-going culture. Because even if kids aren’t thinking about going to college, they’ll at least have the option,” he said. “The District needs to look at what’s happening in schools in order to change what’s not working. If we continue down the same path, then children are going to fail. If we sit back and do nothing, we’re going to keep the bar very low." The simple fact is that even though an array of college prep courses are now offered across all LAUSD high schools, the promise of learning supports and necessary resources is not being realized. It’s one thing to speak of these things in the abstract – as a function of District policies or the result of bureaucratic inattention — but these issues have a face. They have a name. And for the students affected, the problems are both significant and immediate. María Alexandra García is a student at the School for the Visual Arts & Humanities – part of the Robert F. Kennedy Community Schools in Los Angeles. Her story is not uncommon. And the problem doesn’t stop there, according to García. “In addition to this, I have been told that we may not have a college counselor next year, because the school doesn’t have enough funding to hire one,” she said. “This worries me because that’s one less counselor, since our regular school counselor has already retired." Obviously, the District bears an enormous burden in ensuring that the true promise of the A–G resolution is fulfilled. They have a mandated responsibility for students who are not being properly supported, and the district must find the budget and resources to prepare every high school student for college and a career. But the responsibility doesn’t rest solely with them. María Mateo, a parent to four current and former students at West Adams Prep sums it up well. Mateo is concerned there is too big a gap between providing mandatory courses and providing understanding for the students. It is not an easy path. And one that can’t be done by any individual entity or party. Mateo summed up how simple, yet difficult, the path to achieving everyone’s goals is for students. To support local students and become more involved in Los Angeles education, United Way of Greater Los Angeles invites you to join one of our affinity groups and commit to making a lasting impression on the education of this generation and many more to come. Thank you for reading our series on how the student Walkouts of 1968 helped usher in a new era of educational opportunities for students throughout Los Angeles. And we invite you to help us ensure that the promise of those opportunities will be fulfilled by donating to United Way of Greater Los Angeles.